Beginning in 2006 Algoriddim began developing professional-grade DJ software for the Mac. By 2011 Steve Jobs was using djay for iPad to demonstrate that mobile devices are not just about consuming content, but creating things. Now, Algoriddim is bringing its award-winning software to Android phones and tablets. The app is easy to pick up and start messing with. You can tap the music note above one of the digital platters to add a song on each platter. The needle moves responsively, letting you skip ahead in the track like a real record. Swiping over the record allows you to scratch it against the needle or scan through the track. The side bars next to the platters adjust the BPM, which can also be set manually by tapping the BPM at the top and then tapping to the beat. Pressing Sync sets the track to the BPM of the other to allow for a more seamless transition between songs with different beats. Below the BPM levels you can set the levels for the low, mid, and high levels of the track as well as the gain, add different effects on top of the track, set loops, and add cue points. When a track ends the app transitions the volume from one track to another automatically. Most of the time I found myself setting up a playlist using Automix, which automatically selects tracks to add and transitions between them. This is perfect if you have a bunch of tracks on your phone that you want to just play in the background, sort of like Genius on iTunes. The app also includes transition tracks like sirens and scratches to transition between songs differently. Just using the app on your phone is incredible, but for professionals it takes on a whole new level when you realize that you can use this app with professional DJ equipement like the Reloop Beatpad. With the reloop you get physical controls for music playback, play different effects, and a jog wheel to browse through tracks. Combined with the Beatpad, djay distinguishes itself as a true professional’s tool with incredible portability. On iOS, Algoriddim was able to tap straight into users’ iTunes libraries to add tracks. 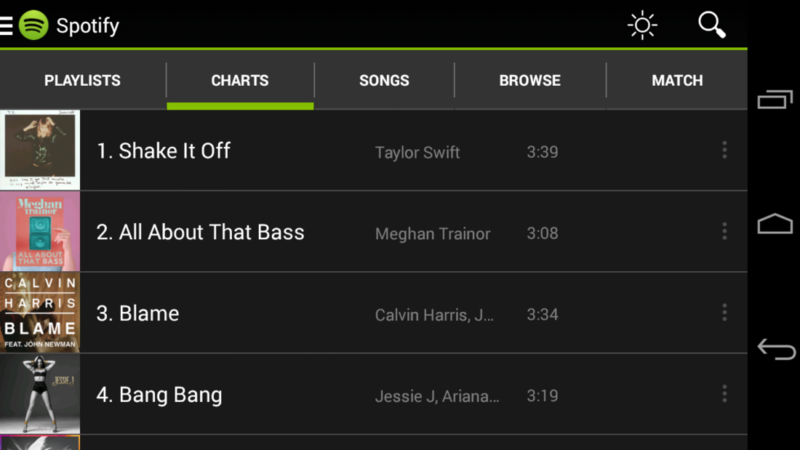 Unfortunately, there isn’t a way to do that with Play Music on Android. In Play Music you can download tracks for offline playback, but the files are inaccessible to the user (even files that you uploaded yourself). If you want to use your own music files you’ll have to copy them onto your phone’s storage manually (djay supports mp3 and aac files). If you have any music that you’ve purchased from Amazon over the years you can use the Amazon Music app to download those songs onto your phone and djay will read them without issue. 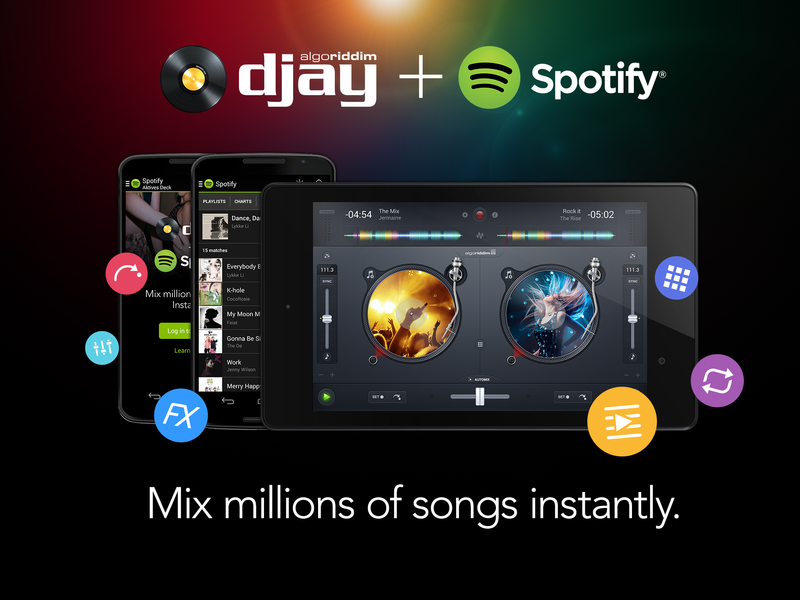 The good news is that Algoriddim has worked out a partnership with Spotify, enabling users with Spotify Premium accounts to access all of their artists, albums, and playlists in the app (a seven day free trial of Premium is available to all djay 2 users). The huge advantage here is that this makes it far easier to share a playlist between DJs and friends. When I got married in 2012 I had to send our DJ an extensive playlist (and more importantly, a do not play list). Using Spotify makes that whole process so much easier, especially for DJs using Algoriddim’s software. My favorite thing about using Spotify, however, is the Match feature. While you have a song going, on the other side of the table you can que up your next song using the Match section in Spotify. Match will list up to 20 songs that matches the vibe of your current song, allowing you to either select from a classic follow up tune or try out a new song that Spotify suggests. I think a big question for our reader is who is this app for? Well, if you’re a djay with an Android device then this app is definitely for you. If you’re like me and you’re regularly asked at gatherings to get some music going, then this app is also perfect for you. If you’re the kind of person who loves the convenience of digital music but misses the human side of things, this app is a great way to bring that back into your life. djay 2 for Android is available for a limited time at the low price of $2.99 on the Play Store and Amazon Appstore.